Last night at the bar after frisbee practice, this question was asked by Hannah (the Canadian) to Chris, an American from Michigan who had just arrived in Madrid a week ago. I was sitting nearby. She said to Chris, “Please don’t say what I think you’re going to say,” which made me doubt the few Canadian cities that had come to my mind as possible guesses. Chris first guessed “Toronto,” which at the time seemed like a good option. "No, no, Quebec's also a city, it's okay" said Hannah. But that wasn't the capital. "We're neighbors!" Hannah said, "How do you not know this?" The thing is, we learned close to nothing about Canada during K-12. Well, in sixth grade we learned the names and capitals of the Canadian provinces. So great, in the year 2000 I could correctly label the Canadian provinces and province capitals. But that memorized information obviously didn't stick around for long in my head. My dad went to Toronto for work back when I was in elementary school, and he brought me back a small colorful fanny pack that said "Toronto". So that's probably why Toronto came to mind so quickly last night. Also: Toronto Maple Leafs. During high school, I heard the occasional joke or two about Canadians from teachers. Some teachers also liked to joke around and poke fun at the French a lot. Which led me to continue knowing nothing about Canada (and not caring), and to think that French people were lazy - even though I had never met a French person in my life. It's a pity though, because had I not heard so many negative opinions of France from teachers and peers, I might have actually considered learning French alongside Spanish in middle/high school. Rather, I blindly accepted these opinions of my teachers and thought learning French was absolutely useless. Until I came to Europe my junior year of college, met French people, needed to speak French in Morocco, then returned and took two semesters of French my senior year of college. I'm still studying the language in my free time, but think of how much I'd know if I had started studying French in high school. Point being: Teachers - Students are impressionable, especially young ones. Let them make their own opinions; just teach them facts. And if you're not a teacher, you're still a citizen of the world. Those with international friends, do what you can to end stereotypes, and don't keep your international experience to yourself. Share what you've learned. But I digress. Back to Canada. Basically its presence was barely there during my formal education, and the country was rarely talked about on American news or in day-to-day conversation. In fact, most of what I know about Canada (which is obviously hardly anything), I learned this year from Hannah. That includes learning that the capital of Canada is Ottawa. 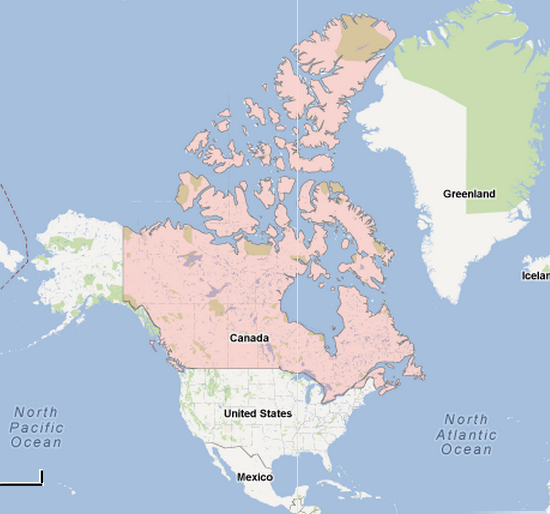 Here's a map so that we can all brush up a bit on our Canadian geography. I think I'm going to resume my project from a summer in high school of learning the world's countries and capitals. I'd like to know: Did you know the capital of Canada? Were you shocked that I didn't? Where did you grow up, and what were you taught about Canada in school? FYI, that map you posted at the beginning is distorted because of the projection, Canada is only slightly larger than the US in terms of area (9,984,670 km2 vs. 9,826,675 km2).